Field Yates says the Dolphins' No. 11 pick Minkah Fitzpatrick will have an immediate impact on defense and special teams. NFL prospect Minkah Fitzpatrick says he wishes he didn't cut his hair and will be growing it back after the draft. Minkah Fitzpatrick tells Holly Rowe that he's willing to play wherever NFL coaches think is best for him in the secondary. 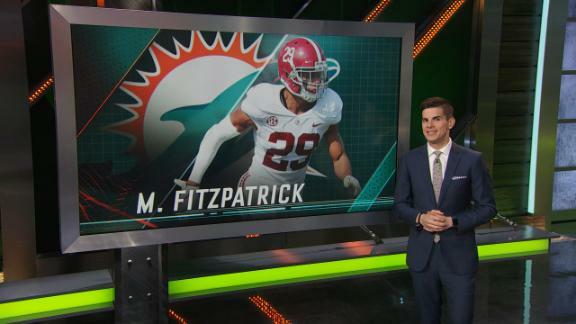 Todd McShay offers why Minkah Fitzpatrick is a top-10 player in the 2018 draft. The Top-10 projected pick in the 2018 NFL draft sits down with Damien Woody and Mike Greenberg to break down his skills on the field. Who will shine brighter: Fromm or Fitzpatrick? Stephen A. Smith and Max Kellerman predict which player will dazzle tonight during the CFP National Championship. Get to know Alabama DB Minkah Fitzpatrick as he answers rapid fire questions about himself.